1. The average person has at least 5 dreams each night. 2. Most dreams are 5 to 20 minutes in duration. 3. Over a lifetime, you’ll spend approximately 6 years dreaming. 4. There are 5 stages of sleep and it’s only during the final stage (called ‘REM sleep’) that you dream. 5. Dreams are an expression of your real life thoughts, feelings, concerns and experiences. 6. Everybody dreams; even those people who can’t remember having any. 7. When you are snoring, you are not dreaming. 9. Toddlers do not dream about themselves until around the age of 3. From the same age, children typically have many more nightmares than adults do until age 7 or 8. 10. Believe it or not, your body is virtually paralyzed during your sleep – most likely to prevent your body from acting out aspects of your dreams. 11. We only dream of what we know. The evil killer in your latest dream may be the guy who pumped petrol in to your Dad’s car when you were just a little kid. We have all seen hundreds of thousands of faces through our lives, so we have an endless supply of characters for our brain to utilize during our dreams. 12. People who become blind after birth can see images in their dreams. People who are born blind do not see any images, but have dreams equally vivid involving their other senses of sound, smell, touch and emotion. 13. If you dream about some particular subject it is not often that the dream is about that. Dreams speak in a deeply symbolic language. The unconscious mind tries to compare your dream to something else, which is similar. 14. Men are more likely to dream about other men than they are to dream about women; whereas women dream of women and men equally. 15. A particular dream that recurs and persists over a period of time is a strong indication that an important issue in your life needs to be resolved. 16. Whilst dreaming, some people realize that they’re dreaming and are able to control what happens in it; this is called ‘lucid dreaming’. 17. Before trying to sleep, spend a few minutes thinking about the good and bad points of your day; doing so clears your mind and improves the quality of your dreams. 18. Watching television or reading a book immediately before going to bed increases the likelihood of you dreaming about what you watched / read; such dreams tend not to have hidden meanings. 19. 5 minutes after waking up, people forget 50% of the content of their dreams; 10 minutes after waking up, 90% has been forgotten. 20. Questions you should try to answer about your dreams: who was in it? ; where did it occur? ; was it day or night? ; what did you do? ; did any images, items or symbols stand out from the others? ; how did you feel? 21. Dreams about your teeth are the most common type of dream. 22. Types of teeth dreams include: teeth falling out; rotting teeth; swallowing teeth; spitting teeth. 23. Teeth dreams may arise as a result of: saying something you regret; hurting someone with your words; gossiping about others. 24. A more direct interpretation of teeth dreams is that you’re concerned about some aspect of your physical appearance (not necessarily your teeth). 25. Dreams that involve being naked in public is that you’ve been hiding something in your life from other people. 26. Wearing no clothes in a dream can also represent you not being prepared (or being prepared but not feeling so) for an upcoming situation such as an exam, presentation, date etc. 27. If you dream that you’re naked, but no-one in the dream realizes that you are, it means that whatever you’re hiding or are worried about is not an issue for other people. 28. If you dream that you’re naked, but you don’t care who sees you, it means that you’re feeling comfortable and relaxed about whatever happens to you in your life. 29. If you’re flying in a dream but feel scared whilst doing so, you may have confidence issues and not feel that you’re up to the challenges that you’re facing in your life. 30. If you have difficulty maintaining flight in your dream, someone or something in real life may be preventing you from having the level of control that you want to have. 31. By identifying what it is in your dream that stops your flight progressing, you can identify what it is in your life that stops you progressing. 32. Many people have reported having dreams in which they’re falling and can’t stop themselves from doing so. 33. Some say that dreams involving falling come at times of loneliness; having no-one to hold on to being represented by having nothing to hold on to. 34. Feeling inferior to other people in your life can also result in falling dreams. 35. It’s been said that you can die in your sleep if you don’t wake up from a falling dream before you hit the ground; however, there’s never been any evidence to support this. 36. Dreams involving drowning are very similar to dreams involving falling and are interpreted the same way. 37. It’s common to have a feeling of being chased in your dreams. 38. The typical chase dream scenario involves being pursued by someone or something that wants to hurt you, whilst you run away or hide. 39. Chase dreams represent the way you’ve been dealing with an issue in your life; running away from and avoiding something rather than confronting it. 40. If you don’t recognize the person pursuing you in a dream, it may be part of yourself (your own feelings of anger, fear, jealousy, stress) that you’re running away from. 41. A more direct interpretation of chase dreams is a literal fear of being physically attacked; this may be based on something that’s actually happened to you in the past. 42. Some people dream of either the death of themselves or the death of someone they know. 43. Dreams involving death may occur when you feel emotionally hurt or have a fear that someone or something is about to hurt you emotionally. 44. Death can arise in a dream to signify the end of a phase in your life and the beginning of new one. 45. If it’s you dieing in your dream, there’s likely something within you (typically a strong feeling you have) that you need to let go of so that you can move on with your life. 46. The death of yourself in a dream could also indicate a deep regret of something you’ve done. 47. If it’s someone else dieing in your dream, it may mean that your relationship with that person is suffering and needs attention. 48. The death of someone else in a dream could also signify either a fear of losing them or a desire for them to leave your life. 49. If you experience a disaster in your dreams and find that you’re dealing with it alone, it can indicate that you’re feeling lonely in your real life. Koi jeno shunechi shopne nizer mrittu dekhle naki ayu bare. Khub bhorbela ghum theke uthe bichana te mejaj kharap kore kichukkhon boshe thakar binimoye jodi khanik’ta ayu berei jay, mondo ki! Jai hok, hasshokor ebong dukkhojonok shopner bornona te asha jak. Shopner location jani na. Ekta lohar moto pataton er upor veja kore bali fele rakha. Mone hochche khub purono kono morche pora jahaj er upor keu bali fele rekheche khub obohelay. Tar upor shoto shoto manush. Keu hatche, keu dourachche.. but shobai eki dike jachche. Ki jeno hoyeche. Kichu ekta hoi choi bepar. Veja balur vetorei dag deya ache, kintu eto manusher payer chapey shei dag geche nosto hoye. Kichu bozha jachche na, tarporo onek manush ubu hoye shei dag khuje berachche. Amio shei hata hatir dol’e achi. Khub ekta utshaho pachchi na jodio. Hele dule balir upor diye aste aste gorate gorate hete jachchi. Jete hobe bolei jawa. Ekta suit tie pora lok ke dekhlam tar shoman boro ekta lohar tukro thele thele niye jachche ulto dikey. Amar dan pashe shagor ba nodi ba kichu ekta. Hotath dekhi duto manush balur upor morar moto pore ache, onno ra tader hush feranor cheshta korche. Onnora je khub ekta care korche, taw na. Vab khana erokom morle mara jak beta ra, kar ki! Ami kache giye dekhi du’joner ekzon amar khub close ekta friend. Ami take tene uthate gelam, she nije thekei uthe daralo. Uthe jeno amake chintei parche na. Pashe ekta bati te moyla nongra pani rakha. She shekhan theke moyla pani khawa shuru korlo. Ami take koyekbar dhakkalam pashe giye, tobu she amake chinte parlo na. Dhakka diye amar hat shoriye dey ar chuk chuk kore pani khay. Ami abar hata dhorlam. Ektu por giye dekhi shobai shamanno ektu jaygar modhdhe joro hoyeche. Ki jeno ek birat kando ghoteche. Ke naki kake dhakka diye pani te fele diyeche rag kore. Keu kono kotha bolche na, fish fash korche shobai, chapa ekta uttejona. Ami matobbori kore mukh foshke bole boshlam.. “ete eto dhong korar ki ache, amra bangali jaati, etai to amra kori, amra jene shune eke oporke dhakka mere pani te fele dei.. tarpor sheta niye lok dekhano maya kanna kori”. Eta bolei ami buzhte parlam, shobai amar upor khub khepe geche. Bangali jatir vab-murtir upor eto boro aghat hanar jonno shobai amar dike besh gorom gorom chokh kore takachchilo. Ami chup mere gelam. Ami just kothar kotha hishabe bolechi, thattha kore. Ami abar hata dhorlam. Ektu por giye abbu ammur shathe dekha. Tader besh mon kharap. Amader modhdhe kono ekzon ke azkei naki eka kothaw chole jete hobe. Abbu khub e birokto. Abbu dhorei niyeche, takei jete hobe. Tar kotha hochche azke keno! Office e koto kaz pore ache. Kalke kaz gulo shesh kore tarpor gele ki hoy! Amra hete hete ekta pukurer pashe eshe hajir holam. Dekhi bhaiya o koi theke udoy hoyeche. Pukur vorti shudhu manush ar manush. Shobai ordhek pani te dariye ache. Dekhe keno jani obak lagchilo na, mone hochcilo eto manush pukur e komor pani te dariye thakbe etai to shavabik, dariye na thaklei borong o’shabhabik mone hoto. Pash diye ekta rasta geche, shei rasta te kichu gari khub tara huro kore prochondo goti’te jachche. Ekta garir gaye ar ekta garir bari lagche, spark hochche, kintu keu care korche na.. shobai jeno jibon bachanor jonno dourachche. Tarpor ki ki jeno holo, mone nei. Ek porjay’e pukur theke duto young chele uthe ashlo, du’jon e sweatpant pora, vodro chehara. Amra charjon kotha bolei jachchi. Hotath dekhi shei du’joner ekjon amar pechone eshe daralo, tar gaye jacket, jacket er pocket theke ekta revolver er matha ber hoye ache. Ami takatei she bollo, ‘bhai, kach theke korbo, beshi kosto hobe na’, eta shunei ami zhot kore matha ghuriye fellam.. shathe shathe gulir bikot ekta shobdo holo. Ami pukurer dike mukh kore achi, chele ta amar pechone. Ammu chitkar korche, “amar chele ke guli koreche! amar chele ke guli koreche!” Ami kono rokom betha pachchilam na, mathar pechone hat dilam, na matha veja na, tar mane rokto tokto ber hoyni, kono gorto torto bozha jachche na. Tar mane nishchoi guli kore ni, beta fazlami kore amake voy dekhiyeche, hoyto purono kono bondhu tondhu hobe. Ami ghure chele tar dike takalam. She thik amar bam chokhe ditio guli ta korlo. Bam chokh ta amar jole uthlo. Mone holo amar mathar vetor diye lal ekta tunnel boye gelo. Ami tup kore pani te porlam chit hoye. Tokhono buzhte parchilam na ami mara jachchi kina, mone hochchilo hoyto amar chokhe color gun diye rong tong chure mere fazlami koreche. Buzhte parlam, jokhon dekhlam ami hat pa narate parchi na. Emni te shamanno pani te dub dilei ami hapush hupush korte thaki. Ar ekhon pani te pore toliye jachchi othocho ekta angul o narate parchi na, nizeke pani theke tule anar kono cheshtai korte parchi na, jodio ichcha hochche. Oshojjo kosto lagchilo, mone hochchilo ami amar shomosto prithibi, amar shob theke kacher tin ta manush ke rekhe panir shathe goley mishe jachchi. Tara nishchoi chitkar checha-mechi kanna-kati korche shudhu shudhu, naki tader kew mere felbe chele’ta? Amakei ba marlo keno? Ami Bangali niye halka ekta comment korechi, ei karone? Ami pani te toliye jachchi, ar vabchi.. aha re! morei gelam! evabei shob shesh holo! ek muhurto agew buzhte parlam na! Koto chinta korechi ei mrittu niye, na jani ki hoy! Othocho ki shohoj bepar. Sharirik kono kostoi nei, puro kosto tai nizer ostitto shesh hoye jabar kosto ar shobai ke fele chole jawar kosto. Agey vabtam, mrittur por ki asholew aro ekta jibon thake! Naki movier moto hoy, just manush more jabar por tar nizer kache she eki manush theke jay, shudhu tar shorir ta chere she uthe chole jay ar ek jogote! Ei jogoter manush takey hoyto ar dekhe na, kintu tar amitto te thekei jay. Ami buk bhora hahakar niye pani te toliye jete jete buzhte parchilam, eshob kichui hoy na mrittur por. Shudhu dop kore prithibi ta ondhokar hote hote ek shomoy nive jay, ‘ami’ bole ar kichu thake na tarpor. Thik tokhoni moncher porda uthe jabar moto kore ghum vanglo. Morini dekhe ektu veba-cheka kheye gelam prothome. Proti ta manusher mrittur por jodi tai hoy? She chokh mele takiye dekhe, she onno ar ek jogote geche, ghum vengeche, tar ager jogot ta shopno chilo. Ditio jogote ghum venge shob kichu notun kore kolpona kore ney prothom theke. Duto jogot’e shopno, duto jogot’e bastob. Ditio jogot’e mrittur por aro ekta jogot. Baksher vetore baksher moto, jogoter vetore jogot shudhu. Shopno ar bastober makha makhir jogot ononto kal choltei thakto. Ami chacha hote jachchi. Ei tiny little fellow ta amar nephew. 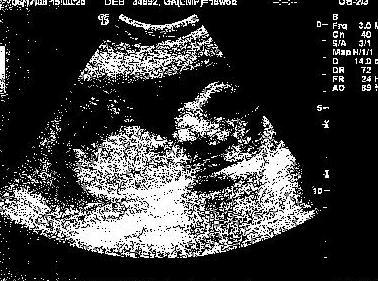 Az ektu age Bhabir kach theke 19 weeks er untrasound image ta pelam. Chacha hobo chacha hobo jene ashchi besh kodin dhore. Kintu hut kore azke chobi ta dekhe kemon jeno lagche. Chotto ekta matha, gappush ektu pet, shamanno shorir, ei tukun ei tukun choto choto gholate gholate osposhto hat pa! Jolo-janto ekta notun jibon. Mone koto odbhut chintai na ashche. Ei tukun manush ta ekdin prithibi te ashbe, ashe pasher shomosto kichu alokito kore bere uthbe, thop thop kore hata shikhbe, dourate shikhbe, vabte shikhbe, school e jabe, rag korbe, birokto kore marbe, chor khabe, khamchi dibe, fokla dat ber kore hashbe, hashabe, aro boro hobe, college e jabe.. tarpor kono ek din ei pichchi tai ar pichchi thakbe na, ekdom boro hoye jabe. Tar biyer onushthan e ami buro chacha tokhon bole bozhanor cheshta korbo ki vabe amar chokher shamne pichchi theke dekhte dekhte boro hoye gelo she. Keu amar kotha tokhon hoyto monojog diye shunbe o na, vabbe buror kichu ekta bolar dorkar tai bolche, azaira bhod bhod korish na buro! Tokhon shobkichu onek bodle jabe nishchoi, hoyto amra onekei thakbo na abar hoyto onek notun mukh jukto hobe dole, jader ostitter kotha amader kache ekhono ojanai roye ache. Manusher chinta vabnar prokria ta asholew bichitro, kono niom mene chole na. Ekta shishur jonmo hole manush chinta kore, bachcha ta ekdin boro hobe, hata hati korbe, dourabe, shobar kole kole ghure berabe. Ar ami vabchi she boro hoye ekdin biye korbe! Hotath kore nizeke buro mone hochche. School’e thakte shob khela te 3 ta dol thakto. Choto dol ‘KO’, mazhari dol ‘KHO’ ar boro dol ‘GO’. Etodin mone hoy jiboner khela te ‘KO’ dol e khelechi. Hotath kore az mone hochche ‘KHO’ dol e dhuke porlam. ‘KO’ dol e notun khelowar ashche, tader jonno jayga kore dite hobe. Tarpor ekdin dhire dhire ‘GO’ dol e jete hobe. Shob sheshe ekdin tup kore khelar boyosh tai par hoye jabe, ei vubone khelar maya chere hoyto onno kono math’e jete hobe. Er theke khelowar na hoye, dorshok holei bhalo hoto ..ononto kal khela dekhei jetam, dekhei jetam. KO, KHO, GO, GHO, UMO, CHO ..ekdom CHONDRO-BINDU dol porjonto. Taw hoyto poshato na, ek shomoy birokto lege jeto. Tokhon dorshok gallary venge chure paliye jete hoto onno kothaw. Shishu park e choto choto khelna gari chalanor jonno ticket counter er pashe dag deya ekta jayga chilo. Height shei daag theke beshi hoye gele, shei khelna gari te aar otha jeto na. Prothom jedin ami jante parlam ami boro hoye gechi, matro 1 inchir jonno ami ar shei gari te uthte parbo na.. ki afsos e na korechilam! Boro howa eto koster! Mone hochchilo ei prithibi te beche theke ar ki hobe, ei gari tai jodi chalate na parlam! Aj koto khelna gari par hoye eshechi, aro koto gari na jani par hote hobe. Ei shedin-o pichchi chilam. Amar kono ek dur-shomporker nani amake ador kore dakten ‘Shonar Bandor’ ar gaal tipten. Amar oshojjo rag’e ga jole jeto, nani ke golper boi theke uthe asha daini buri mone hoto. Shei shonar bandor ekhon petoler honuman e rupantorito hoyechi. Bandor boro hoye honuman hoy? Jani na. Shei nani beche nei. Tini hoyto ba bolte parten. Bhaiya ar ami khelna gari niye kheltam, nana bari te gele amra duijon nanir uchu palonker niche dhuke boshe thaktam, charidike kapor diye gheraw kore. Ghor ghor khela. Khater nich ta hochche amader ghor. Khat er railing er upor balish diye tar upor boshe jake petam takei guli kore dhorashayi kortam. Shei pranhin kather railing’er tokta chailei hoye jeto ghora, kokhono ba motor-cycle, jokhon jeta ichche. Shishu der jogot tai onno rokom, anondomoy ebong barabari rokomer atto-kendrik. Ami ek paye lafiye lafiye ghora chalanor besh expert chilam, shathe thakto mukh diye ‘tokkosh’ ‘tokkosh’ kore shobdo. Amar mone hoto boro ra amar ei ghora chalanor protiva dekhe tara shobai na jani kotoi mugdho hochche! Bhaiyar khelna telna shohoje vangto na, she choto bela thekei tar ashe pasher shob kichur jotno nito. Ami chilam bid’dhongshi shovaber. Amar khelna telna put put kore venge jeto. Tokhon bhaiyar pechone pechone ghure beratam. Ekbar amader dhanmondir bashay churi holo, chor churi kore jabar shomoy bhaiyar bishal garir bohor shathe kore niye gelo. Bhaiyar she ki kanna. Basha churi geche, ei dukhkhe Ammu kadche, khelna churi geche, ei dukhkhe kadche bhaiya. Ami mon-e fur fura anondo niye ghure berachchi. Mondo lagchilo na. Bhalo hoyeche bhaiyar khelna churi geche. Karon she tar room e dhuktei dito na, gari chowa to dure thak. Amar ekhono mone ache, shada ronger ekta ‘DIE-HARD’ na ki lekha gari chilo, jeep er moto, oi garir jonno je kono shomoy ami amar jibon diye dite prostut chilam. Dupur bela amader dui bhai ke cod-liver oil makhiye rod e boshiye rakha hoto. Shei macher teler chilo voyaboho bisri gondho, ga ulte bomi ashto. Amra roder modhdhe dui bhai badorer moto lafa lafi kortam toilakto obosthay, khali gaye. Barandar dorja beye othar ek moha-koushol amar jana chilo. Ami tel chik chike gaye shei dorja beye beye uthtam ar namtam ebong pray protidin e ekta kore half pant chirtam. Shei bhaiya ar ko mash por baba hote choleche. Ekhoni tar khushi dhore na. Sharadin’e naki she hashe shudhu. Vabi kono karone zhari dilew hashe. Jei shishur jonno amader eto anondo, she o ek din boro hobe. Tar jibonew hashi anondo koster bepar thakbe. Tuchcho shob jinish niye she-o upset hobe. Ekdin shei tuchcho jinish katiye bere uthte shikhbe. Tar jibonew erokom ‘zhari khelew hashi ashe’ obostha hobe. Prarthrona kori, tar jibon jeno ‘zhari khelew hashi ashe’ moto muhurto diye poripurno thake, prithibir kono dukhkho jeno take sporsho korar shahosh korte na pare. Hotath mone hochche, prithibi te eto kichu korar, ar shomoy eto olpo. Janio na koto kichu korar baki ar koto olpo shomoy-e ba baki! You are currently browsing the ishti DOT com blog archives for June, 2008.